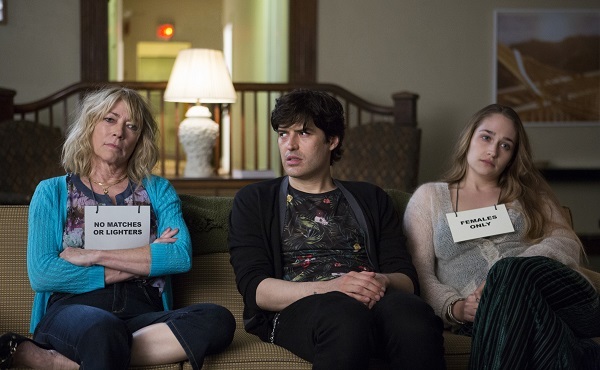 Kim Gordon showed up in the Girls premiere on Sunday night. Pretty sweet, right? But she’s not the only musical influence this season. Music fans who tuned into the premiere of Girls Season 3 last night may have caught another familiar face in the mix. Sonic Youth’s Kim Gordon played a small role on the first episode. She isn’t the only musician connected with the newest season of the HBO smash hit, though. Girls has quite a few new songs set to premiere throughout the season, too. When Hannah’s (Lena Dunham) friend Jessa did her much-needed stint in rehab, she made a few unlikely friends and foes. One such person was Mindy, a sweet, meth-addicted member of the support group Jessa is forced to attend, and they soon find themselves clashing. That chick was none other than Gordon, from ’90s rock band Sonic Youth. Gordon seems to have plenty of extra time on her hands. In 2011, the band came to a soul crushing “pause” when Gordon separated from her husband and band mate Thurston Moore. Last year, her band mate, Lee Ranaldo, suggested it was in fans’ best interest to let go and move on. The exes were still bickering and a reunion seemed unlikely. Sonic Youth fans were rightly heartbroken. Luckily for Girls fans, her split from the group enabled her to stop by the show. Who knows? Maybe she’ll reappear later in the season. Gordon isn’t the only musical influence on Girls this season: The show will also be debuting multiple new songs — Lily Allen, Jenny Lewis and Beck are all set to release music in the upcoming season. The highly anticipated song from Lily Allen, “Late Comer,” will appear on an upcoming episode. Meanwhile, sometime during the season, Girls will premiere Beck’s first single “Blue Moon” off his upcoming new album, Morning Phase.